Marina's Kitchen Table: Five Minute Friday - Prompt - "In Between"
Sigh. It's late and I want to do this FMF post with Lisa-Jo Baker and her gang. Five minutes (flat) of writing. No track backs, corrections, just writing frenzy and free. I'm stuck IN BETWEEN two thoughts, ideas, blogs and seemingly worlds. It can be so confusing sometimes. Yet in my mind, when I think deep in prayer, it's crystal clear. I still dream of being in church in Indiana, at Crossroads in Newburgh. My dreams take me there about every other night. Good dreams. Joyful times. It feels like home. I own it. I've invested there, and they've mutually invested in me. It's a great relationship. But now, now I live 10 hours and 3 states away and don't have a place (church) to hang my hat. We thought we did, but as great a church it is, it was very much not a place to stay. It was like the shoes I wore to my son's wedding last week - pretty and the right size and matched well what I was wearing...but boy, were they uncomfortable! It just wasn't the right fit for us to grow and stay in. It was the difference between becoming a member of the church or finding a family. We could serve there, but we didn't find relationships. At all. WELL, I didn't mean for that to be so...pitiful?? Sad?? Oh well, it's what came to mind when I heard "in between" as the *word* for this week. And in actuality, when I THINK of Crossroads, living in KY and going to church across the river in IN, it makes me happy. REALLY. I'm grateful for life-long friendships that will travel with me, no matter where God calls us to live, work, serve. Not pitiful or sad. Just a season. And one I'm in as well. We're looking for family and in between churches too. Transitioning into better things but not wanting to break things as we leave. I get it. And I'm writing a book too while reading and life takes over. So I totally know exactly where you are, Marina. So good to connect again since Jumping Tandem. I'm glad I linked up right behind you! It's definitely ok to have a heart-spill once in awhile! Prayers for you as you look for that place that is just the perfect fit. We moved a few years ago, and I thought we'd never find home here, but He gave us a wonderful one. Praying that for you, too, friend. Blessings to you! Oh, I read your words and can hear your heart. Not feeling "at home" is such a lost feeling. May you connect soon, find your time and His words and I hope you find sweet times soon. And thank God for those life-long friendships. You are blessed. 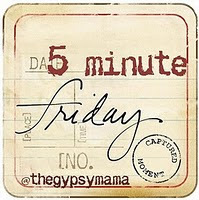 visiting you from the Five Minute Friday. We all have seasons in life where the in-between can be hard. I pray that you will be able to settle into a church as the Lord leads you. Have a blessed weekend. Oh Marina...I get this. I've been in a similar season. Praying for you today! You are such a lovely example that life has in betweens - always. No matter your age or stage they come and they go. Thank you for showing us that. It's important. I know the Lord will guide you to just the right place. He's made those shoes uncomfortable on purpose and you have made him glad by listening to the pinching (some don't), so that He can take you right where you need to be. How awesome is that? There is such a big difference 'between becoming a member of the church or finding a family.' It can and does hurt as much to leave our faith family as to leave our biological family. This time of being in between can hurt but it can also be such a time fo seeking Him. May He bless you during this seeking time. I think we all spend a lot of our time at the in-between. There is no perfect church, marriage, parent, home, city, job, or circumstance. What is reality and workable now may not be in our tomorrows. The Lord guides us and leads us to where He wants us to be for the now. Hopefully, we have listened and traveled to that place through Him rather than by our own will. Wherever we land, we can find moments, highlights and blessings from which we can glean a purpose. In time, He'll move us onward. Praying for you in the in-between circumstances, and that you will continue to do His will as He moves you forward!